IMPORTANT:The MySQL database appliance is not intended for enterprise installations. If your organization has an existing MySQL or Microsoft SQL database, it is recommended that you configure Filr to use the existing database. If you already have a MySQL or Microsoft SQL database server that you want Filr to use, you can skip this section and continue with Section 5.3, Configuring an Existing Database Server. Select the datastore where you want to store the virtual machine files, then click Next. Create a separate VMware hard disk (Hard Disk 2) for the appliance. This hard disk is used to store configuration files that are used for appliance upgrades. IMPORTANT:If you do not create a separate VMware hard disk as described here, you cannot upgrade to a new version of Filr. In the Capacity section, specify the amount of hard disk space that you want to allocate. To see a formula to calculate the storage requirement for your environment, see MySQL Database Appliance Storage. IMPORTANT:Do not change the controller to VMware Paravirtual at this point of the installation process. Finish the installation and power on the Filr system. In VMware, change the controller to VMware Paravirtual. Power on each appliance in the Filr system. In the Virtual Machine Properties window, on the Hardware tab, click Add. In the Disk Size field, specify the amount of hard disk space that you want to allocate. The recommended minimum is 20 GB. For more detailed information about the type of information that is stored here, see Filr Appliance Storage. In the Virtual Device Node section, select SCSI (2:0) from the drop-down list. Leave the Mode section blank, then click Next. You do not need to select anything in this section, because unlike Hard Disk 2, this hard disk does not need to be carried over on an upgrade. (Optional) Add an additional Network Interface Controller (NIC). An additional NIC should be used only if you have multiple networks associated with the Filr installation; bonding or teaming NICs is not supported with Filr. For example, if your search index and database are on a separate network from the main Filr appliance, you can configure an additional NIC for the second network. Select Ethernet Adapter, then click Next. In the Network Connection section, select the secondary network associated with the Filr installation. Increasing the memory for the appliance does not automatically provide MySQL with more resources. In addition to increasing the memory in VMware, you also need to increase the memory within MySQL itself. For information about how to accomplish this, see the MySQL documentation. IMPORTANT:Do not power on the appliance until you have created the hard disk, as described in Step 11. Create a new directory inside the images directory where you can download the Filr software. The name of this directory must be the same as the name that you plan to use for your Filr virtual appliance. For example, if you plan to name the Filr appliance FilrDatabase1, the name of this new directory must also be FilrDatabase1. A filr -version directory is created; it contains a .raw file that you will use to run the virtual image. Rename the virtual machine by clicking Name of Virtual Machine and specifying a new name in the Name field. Then click Apply. For example, FilrDatabase1. Source: Click Browse, then browse to the .raw file that you untarred in Step 6. Size (GB): The default size is 20 GB. This cannot be changed. Create a separate Xen hard disk (Hard Disk 2) for the appliance. This hard disk is used to store configuration files that are used for appliance upgrades. IMPORTANT:If you do not create a separate Xen hard disk as described here, you cannot upgrade to a new version of Filr. Size (GB): Specify the amount of hard disk space that you want to allocate. A minimum of 100 GB is recommended, but you might need more for your environment. On the Summary page, click Network Adapters. Click New, then specify the desired settings for the new network adapter. Select the secondary network associated with the Filr installation. Create a separate Hyper-V hard disk (Hard Disk 2) for the appliance. This hard disk is used to store configuration files that are used for appliance upgrades. IMPORTANT:If you do not create a separate Hyper-V hard disk as described here, you cannot upgrade to a new version of Filr. In Hyper-V Manager, right-click the virtual machine for which you want to create a new hard disk, then click Settings. Name: Specify a name for the hard disk. For example, FilrDisk3. Review the summary information, then click Finish > OK. In Hyper-V Manager, right-click the virtual machine for which you want to create an additional NIC, then click Settings. In the Hardware section, select Add Hardware, select Network Adapter, then click Add. Specify the desired settings for the new network adapter. Root password and confirmation: The root password for your database appliance. The root user name is case sensitive and should not be capitalized. Vaadmin password and confirmation: The preferred user to use when logging in to the appliance. The user name is case sensitive and should not be capitalized. NTP Server: The IP address or DNS name of the reliable external Network Time Protocol (NTP) server that your OES server uses. For example, time.example.com. After installation, if you are not able to access the appliance and you need to change any of these settings, you can use the VACONFIG utility from the Filr command prompt. For more information, see Using VACONFIG to Modify Network Information in the Novell Filr 1.2 Administration Guide. Domain Search: The domain that is associated with the Filr host name. Do Not Configure: Select this option to configure this network at a later time. If you do not currently know your network information, you can configure the network after installation, as described in Changing Network Settings in the Novell Filr 1.2 Administration Guide. DHCP Dynamic Address: Select this option to dynamically assign an IP address to this network. Statically Assigned IP Address: Select this option to assign a static IP address to this network, then specify the IP address, network mask, and host name. The secondary hard disk for /vastorage that you created for this appliance is automatically detected and sdb is displayed as the hard drive. Accept the defaults for the other options on this page, then click Next. This is the location (/vastorage) where information specific to the appliance is stored and is used when the appliance is upgraded. Each appliance has its own /vastorage location. If you have not already assigned a second hard disk to the virtual machine (as described in Downloading the MySQL Database Appliance and Configuring the Virtual Environment), click Power Off Virtual Machine, modify the virtual machine settings to add a hard disk, then power on the virtual machine. The third hard disk for /var that you created for this appliance is automatically detected and sdc is displayed as the hard drive. Accept the defaults for the other options on this page, then click Configure. If you have not already assigned a third hard disk to the virtual machine (as described in Downloading the MySQL Database Appliance and Configuring the Virtual Environment), click Power Off Virtual Machine, modify the virtual machine settings to add a hard disk, then power on the virtual machine. Configure the MySQL database appliance to change the database administrator password. Replace ip_address with the IP address of your database appliance. Sign in to the database appliance using the vaadmin user and the password that you set during installation. 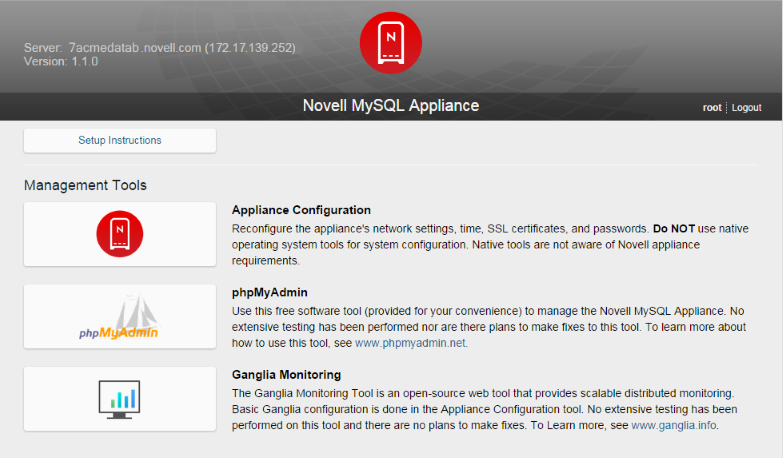 The Novell MySQL Appliance landing page is displayed. Click the phpMyAdmin icon, then click Go to log in to phpMyAdmin. At the top of the page, click Users. In the User name field, specify filr as the new user. In the Host field, select Use text field in the drop-down list, then specify the IP address or host name of the Filr application server. In the Password field, specify a new password for the user, then confirm it in the Re-type field. If you are installing the MySQL database for the first time: select Create database with same name and grant all privileges. If you are upgrading the MySQL database: select Grant all privileges on wildcard name. In the Global privileges section, select Check All, then deselect all privileges in the Administration section. Click Go. Note the user name and password of this user. This is the user you will use to access the MySQL database when you configure the Filr appliance. You can now administer the Filr MySQL database by using this new user. (Conditional) If you have a clustered Filr system with multiple Filr appliances, edit the privileges of the Filr user that you created in the previous step so that each of the Filr appliances is granted remote access to the database. On the Users overview page, click Edit Privileges next to the user that you created in Step 5. Scroll to the Login Information section. In the Host field, specify the IP address or host name of the next Filr appliance in the cluster. In the Create a new user with the same privileges and... section, ensure that keep the old one is selected, then click Go. Repeat this process for each Filr appliance in the cluster. In the Users Overview table, locate the root user with localhost in the Host column, then click Edit Privileges for that user in the Action column. Scroll to the Change password section. In the Password field, specify your password, then confirm it in the Re-type field. Make any other configuration changes. Continue with Section 5.4, Installing the Filr Appliance.